Since the invention of lasers 50 years ago, some scientists have worked to make the new versions bigger and more powerful, while others have been in pursuit of smaller and more efficient models. Now, a group of scientists at Harvard University and Georgia Institute of Technology in Atlanta believe it has taken an important step toward creating an ultrasmall laser with what it claims is the largest spontaneous emission factor reported to date. The hope for nanometer-scale lasers is that they will lead to the realization of compact on-chip photonic circuits. Such all-optical devices could enable a large number of components to be housed on a single chip. When it comes to building tiny lasers, one of the most important goals is to ensure a low power threshold for energy-efficient lasing. Energy consumption is one of the key drawbacks for electronic circuits, and a power-friendly alternative in the shape of photonic integrated circuits could be just the ticket for the semiconductor industry. Yinan Zhang, a member of the Harvard group headed by Marko Loncar, says that thanks to a novel photonic crystal cavity design, they have demonstrated a nanometer-scale laser that requires just 84 μW of power and a spontaneous emission factor of around 0.97. In fact, the power threshold of Zhang’s group’s device is two orders of magnitude smaller than that of commercial laser diodes. The design is outlined in a paper that was published in Applied Physics Letters on Aug. 2, 2010, and is based on carefully patterning quantum wells that have been created in semiconductor materials. 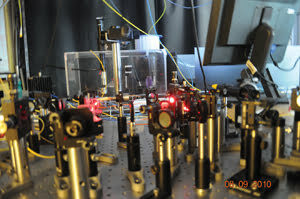 The red pump beam is focused on one of the nanobeams on the chip through the optical objective. The resulting lasing beam is in the near-infrared wavelength and cannot be seen in the photo. Images courtesy of Mehmet Dundar. First, quantum wells are grown on top of an indium phosphide (InP) substrate using metallorganic chemical vapor deposition. The quantum wells are composed of four compressively strained InGaAs layers sandwiched between InAlGaAs slabs. The quantum wells provide optical gain for the lasers and result in light emission across a wide wavelength range maximized at 1590 nm. The quantum wells and InP substrate are then patterned and structured using nanofabrication technology. 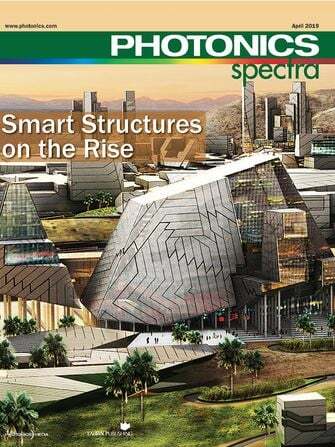 “The structure looks like a bridge suspended on the chip. 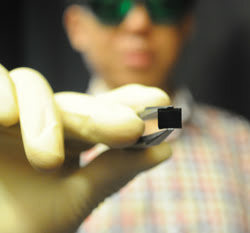 The nanobeam is only around 500 nm wide, 300 nm thick and 20 μm long,” Zhang said, adding that the small footprint enables integration of a large number of devices on a single chip. This InP chip has the potential to accommodate hundreds of thousands of nanobeam lasers. Because the photonic crystal nanobeam can confine light within a very small volume, the device emits a large amount of light even below the lasing threshold. Zhang describes the device as a very efficient LED below threshold, and a very efficient laser above threshold. The team has several strategies in mind to further improve the performance of its nanolaser, one of which is to make it operate with a continuous-wave pump, which can be achieved by introducing a heat sink in the vicinity of the device. Another plan is to enable the laser to be electrically pumped, which is critical to making it compliant with industrial requirements.